One more try at the Welsh rabbit. Photo by Wendi. Months ago, one of the first recipes we tried for this blog was Welsh rabbit (or rarebit), an old-fashioned dish I’d always been curious about but never tried. It did not turn out well. But it seemed clear (to me, at least) that it was a comedy of errors on our part (including the death of our oven in mid-cook, and our failure to deal with it correctly) that probably led to the recipe’s failure, and I vowed to try it again. 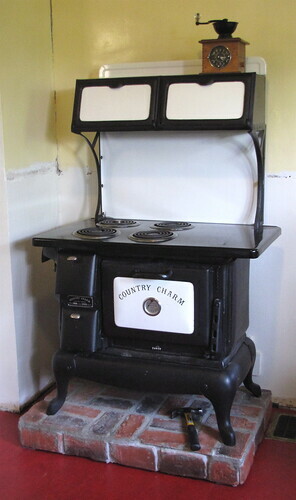 Now I have a working stove and oven, so the time seemed to be right. 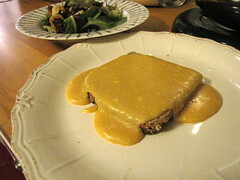 Do try the rarebit again…it is delicious. I serve it over a bowl of nice bread, cut as for fondue, with steamed broccoli and some nice red bell pepper strips. Quick, pretty inexpensive and really good on a winter night. Here are my notes: Use a double boiler and cook out the roux first, beat the egg into the beer and thin the roux with this, then melt in the cheese. Foolproof. We took her advice, using our recipe but her directions. 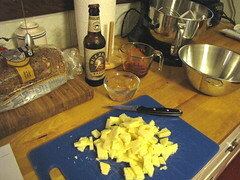 The ingredients were the same, except that we used Buzzsaw Brown Ale instead of Newcastle. We used a metal bowl as a double boiler, and this time the rabbit sauce was dead easy to make and no trouble whatsoever. Lynn was right! Although we now have a working oven again, I was taking no chances — I just toasted the bread in the toaster this time, playing it safe. For a side dish, I served a salad with a sweeter balsamic vinaigrette dressing to balance out the salty savoriness of the Welsh rabbit. It worked perfectly. Kristen wasn’t here that night, and is skeptical that the Welsh rabbit can be good after all, so I’ll be making this again for her to try. The men in the house loved it, though. Compare this with the picture here, and it’s obvious this was a much more successful experiment. Thanks, Lynn!